The largest surfing community in Alaska (about 30 surfers) is now located in the remote town of Yakutat (pop. 800), on the Gulf of Alaska midway between Anchorage and Juneau, regularly surfing good beachbreaks and a quality left on big swells. Yakutat is the best-known surf destination in SE Alaska, but this former Tlingit village is only serviced once a month in summer by the Alaska Marine Highway, so it’s well off the usual tourist trail. Accommodation is limited and expensive, with all mod-cons lodges catering to sport fishermen or Malaspina and Hubbard Glacier sightseers. The other option (most favored by surfers) is to hire a van (expensive) from either of the two rental locations, drive to the forest bordering the beach, and pitch camp, taking all necessary bear precautions. There is only one paved road in Yakutat, and it leads from the airport to the harbor. The harbor is the center point of the ‘town’, which consists of a fish-processing factory, a couple of (large) hardware stores, a couple of bars, a marina, enough housing to shelter the small community of fishermen who live there, and a rubbish dump where bears scavenge for food. It’s a 7-mile (11km) drive from the harbor out to the main beaches; head west from the town crossroads. The unpaved, ever-deteriorating, potholed road leads to an impossibly rickety bridge deep in bear country. Taking the left after the bridge takes you out to the most westerly point, Ocean Cape, a rocky headland that provides views across 20-mile (32km) wide Yakutat Bay to Mount St Elias and the giant Malaspina Glacier, sideways rain and soupy fog permitting. At Ocean Cape there are some pockets of beachbreak held together with rocks marking the northern end of Canon Beach, a long, black sand expanse, so named after the WWII tank relics rusting in the woods. Canon Beach faces SW, is fully exposed to the swell, and is regularly onshore and enormous. Between Ocean Cape and Point Carrew there are more open beachbreaks and a left off the Cape that suffers from horrendous currents. These spots are only worth a check on small summer swells. A right turn at the bridge winds past a graveyard in the forest, which gives way to sand dunes leading to the predictably-named surf spot, Graveyards. This is the furthest east of a series of three points located inside the estuary itself. Bigger swells wrap around Point Carrew, cleaning themselves up on the way, and by the time they reach Graveyards, they’ve swung almost 180º from their original SW direction, and howling onshores have become dead offshores. Naturally, it’s always bigger further west towards Point Carrew. On small days, the left offers an uncomplicated take-off, projecting into an open wall which suddenly warps and actually bends through almost 90º. There are barrels and power on the inside. The whole set-up favors lefts, although there’s a small swell right that’s shorter but steeper. Since several local surfers own boats, exploring the great potential of the islands inside the estuary has likely progressed to advanced stages. 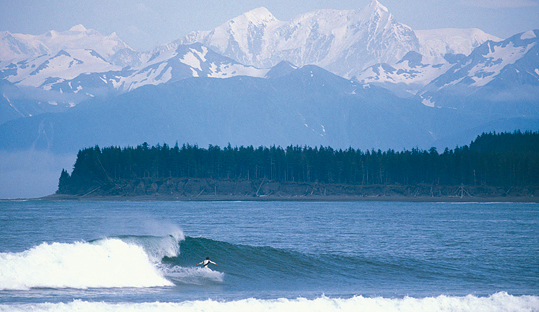 South of Yakutat, the Southeast Alaska coastline continues to provide an inexhaustible number of possible surf spots throughout the islands above the Canadian border. Russian-named islands like Chichagof, Kruzof, and Baranof, as well as the Prince of Wales and the outer islands west of Ketchikan, present fertile opportunities for exploration. The historical city of Sitka (on Baranof), the only population center open to the Pacific, is a jumping-off point for outer island forays and some road-accessible surf south of town. The most dominant swell source is from mid-latitude depressions tracking across the North Pacific, typically born around Kamchatka or the Aleutian Islands and striking land in Western Canada or the Northwest U.S, way south of Sitka. The swells from these lows come in from a S-SW direction, or sometimes W and are biggest in winter (October to March) but low daylight and freezing temps mean it’s probably not the best time to visit. Quite long-period swells are possible, especially if the depressions deepen around Asia. The North Pacific is pretty seasonal so summer flat spells need the local storms to produce some windswells to keep things interesting. Be quick as conditions constantly change. Favour mid-seasons for the best conditions, September being the ultimate month for scoring classic days. Conditions can be very inconsistent, don’t expect surf every week. Buoy Station 46084 - Cape Edgecumbe Buoy AK is the one to watch. Expect 14ft (4.3m) tidal range on spring tides with irregular semi-diurnal variations, while the variations become more extreme further north.